I’ve never been athletically inclined, but always loved the water. Little did I know when I reached out to Marina del Rey-based dive shop Ocean Adventures Dive Co to pursue my certification what adventures laid ahead of me! I spoke with the shop owner and lifelong diver, Erika, who made me feel at ease. “We have been a family run business in this area for over 17 years. I grew up in this shop and watched my dad impact this community. My dad has recently retired and I am excited to continue on with his legacy. Diving is such a special sport and I love that we are able to help people experience a new part of LA,” says Erika. Before donning any gear, I had to read from the PADI Diver’s Manual and take the end-of-unit quizzes. On the first day of hands-on training, we met at the dive shop to review our reading and go over anything we were unsure of. Next, we were fitted for our gear and were off to the pool! We began in the shallow end to get used to our gear and practice underwater skills. Then we moved over to the deep end where we all congregated 13 feet below the surface. Even though we were just in the pool, it was an incredible experience! Next weekend was the ocean dive. We took the Spectre out to the Anacapa Islands for our three ocean dives. I was super nervous about these dives all week – one time I bruised my finger on a library drop box, so that should give you an idea about the level of athleticism that I’m at. Once we left the surface behind us and met at the ocean floor, it was like being transported to another world. Sea lions swam by, lobsters crawled along the reefs, and schools of fish came up to us without fear. It’s the closest you can come to flying – and was an amazing experience. After completing my dives, I became Scuba Diving certified up to 40 feet with a dive master! If you’re in the LA area, I would recommend OADC for your certification because they will give you the personalized attention you need when taking up an extreme sport. The instructors will never push you to do something you’re uncomfortable with. The classes are generally an even mix of male/female, so women never feel othered. Since sports are such a male-dominated arena, this was an extra bonus for me. Erika and the OADC team know that Scuba diving can be intimidating, so they take their time making sure each and every student feels comfortable with their skills. Erika was raised by the ocean (her father owned the shop before she took over!) and has dived all over the world. Here are some of her favorite dive sites! There’s no place like home! With 100-150 foot visibility and the California sun streaming through the kelp, California is home to some of the best diving in the world. The island chain Raja Ampat boasts secret lagoons, bright beaches, and lush jungles. With over 1500 islands to explore, you’ll never have the same dive twice. 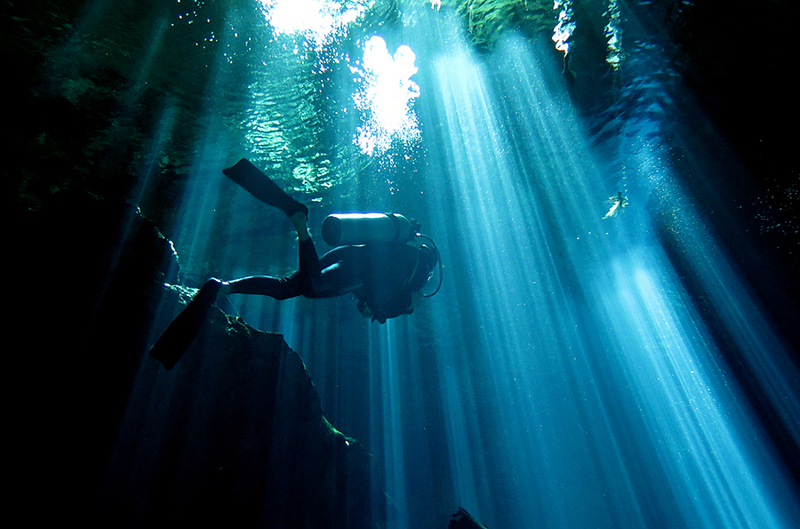 Cenotes are natural pits found in over 7,000 locations across the Yucatán Peninsula. Landlocked states don’t have to miss out on all the fun! Lakes can be less treacherous (no gigantic waves at the surface) and still boast a variety of aquatic life and scenery. If you’d like to learn more about Ocean Adventures Dive Co, check them out on Instagram and Facebook! Once you’re Scuba Diving certified, you can conquer so many of the 20 trips to take in your twenties! Ocean Adventures Dive Co provided Home and a Broad with complimentary scuba certification classes.